McNeill Life Stories Facebook page and click Like. Following is an observation for the math guru’s among you. 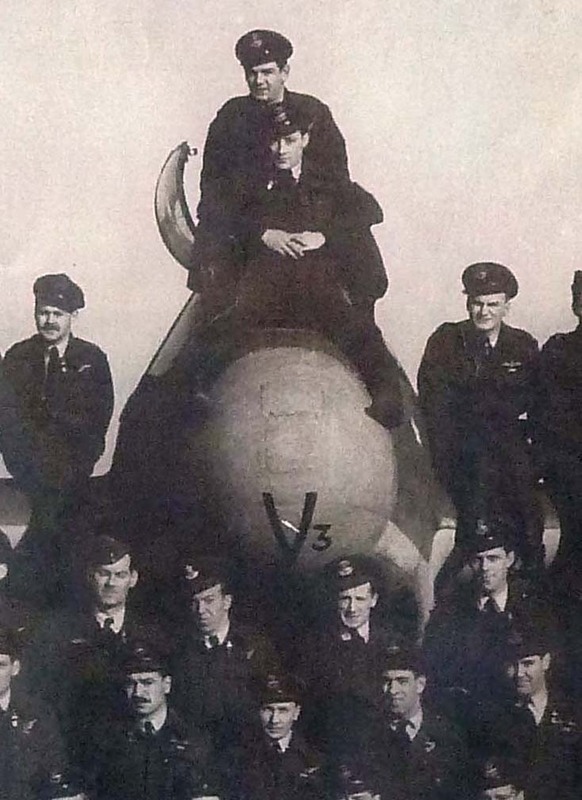 While completing the Black Friday story, I first met P/O Bert Ramsden who, in the 404 Squadron photo, is standing immediately below and to the right of the nose cone V3 painted on the Beaufighter. No big deal, he just picked a place to stand and there he stood very near the symmetrical centre of the photo, a modest 1 in 59 chance of occupying that position. Later, while researching the article, the name of one other member of the squadron air crew still living was found to be P/O Miller Bryce. It was not until I was highlighting names in the photo I discovered P/O Bryce was standing just below and to the left of the V3, shoulder to shoulder with P/O Ramsden. Now there is nothing unusual about just two members being left alive as that was bound to happen at some point. However, that the final two living members of the 59 members in that squadron photo were randomly standing side by side seemed highly coincidental. This will be further discussed later. In an email exchange with Don Flynn, the son of P/O Pat Flynn, I was told I had missed his dad’s name on the photo name list. He told me his father was sitting directly above Ramsden and Bryce on the nosecone above the V3. Sure enough, I had accidentally missed the name the first time around. Now, of the three members coming to my attention, all are sitting or standing in a symmetrical position around the V3 nosecone! During the Black Friday Ceremony held in 2008, in Naustdal, Norway, the two living members (and their families) along with the family of one deceased member, were represented. Of course, the two living members were P/O Ramsden and P/O Bryce. The third, represented by his wife and son, was, take a guess, P/O Flynn, the man who completed the Beaufighter nosecone triangle. I spoke to P/O Ramsden about this coincidence and he was, of course, very surprised. He stated the photo was set up in completely random fashion with no particular position being selected or allotted either by rank or length of service. He could not remember the significance of the V3 on the nosecone but stated there were a lot of Beaufighters attached to the Squadron and he could only remember one having had a V3 painted on the nose. Others had various other markings. 1 x 50 x 1 x 205,379 = 1 in 10,268,950. Is this possible? It seems so as they are standing in those positions. Still, there is more. 1 x 30 x 1 x 10,268,950 = I in 308,068,500. Very large odds indeed, but it happened. Both men, it seems won the Loto 649 many times over as the chances of winning a $2,000,000 prize in the 649 runs about 1 chance in 13,983,816. That lottery win chance is about the same as flipping 24 heads in a row on a coin toss. Assume there were 30 aircraft (12 had just been added from Dunkirk) with only one having had a V3 painted on the nosecone. It could well have been a “D3” or an “H2” or other marking, so it would not really play a role. But still, the V3 still has symbolic significant as a result of the three members surrounding that V3 are central to our discussion. I have not added in the 1 in 30 chance of that particular aircraft being used in the photo as I am not sure that would be valid entry in the probability calculation. If I had the probability would have jumped to 9 billion in one. The final probability is therefore left at something in the order of 308 million to 1 those three men would be together in those position and would have been represented at Naustdal. Pretty high odds in any poker hand. As mentioned in the article, that chance plays an extremely important role in war seems born out by the remote chance these three men would end up together on that particular day in that triangle in the centre of a photograph bearing the number V3. As I may have erred in logic or method in this calculation, any suggestion you have for corrections would be appreciated. Your thoughts on this particular coincidence would also be appreciated? A question was asked about the relative ages of the Squadron members? It is clear that older members would be expected to pass away before the younger. P/O Ramsden was just reaching his 24th birthday when the photo was taken and looking at the face of P/O Bryce, he looks to be about the same age. By far, the largest percentage of Canadians shipped off to war were young (18-30). Assume the average was 25 (+ or – 3 years). P/0 Ramsden (and likely P/O Bryce) were near that average age, that would make half the men older and half younger. I was told by a friend the average life span in I921 (Ramsden’s birth year) was 62 years, so he and Bryce have now exceeded the span by nearly 30 years. As most of the men in the squadron were born in the period of 1915 – 1925, one could reasonably expect almost the entire squadron would have passed away between 1977 – 1987. Ramsden and Bryce (B: 1921) are still here, so they have beat the odds by some considerable length of time. While a probability of 1 in 30 (less than half the number of squadron members) has now been assigned. This could have been much higher, say 1 in 100, or more. I have used the number to 1 in 30, just to be on the safe side in the calculation. A very interesting article. I’m glad that individuals are making the effort to remember an important part of our history. The coincidence is remarkable. I checked the math and it works out. I enjoyed the Black Friday article very much. I’m glad we got to meet Bert. I had been thinking of inviting my fishing buddy, Derek Turner, to listen to Bert. I later told Derek about Bert’s talk and was surprised when Derek said that Bert and he used to work together. Derek is now 86 and joined the Royal Navy at age 17. His service took him from Britain to India and Malaysia and his ship was involved with the D-Day landings. Thanks for this article, Harold. Hello my great great uncle was in the 404 squadron during the Black Friday. His name was HARRY SMOOK from Winnipeg Manitoba Canada. He lost his life falling into the sea and was never recovered. Do you have any information on my uncle please? I don’t know if you are still checking this site but I had to respond again. February of 2017 it will be 72 years since this battle occurred. What caught my attention about this incident was on the Go Deep Documentary that aired on the History Channel. First of all I never known that this battle having ever occurred. According to my grade 3 teacher WW2 had never occurred. That grade 3 teacher stated that the WW2 and the holocaust was all propaganda. All of my classmates they believed her. I hate to say this but all I knew was that soldiers shooting at each other. Mom my Dad my brother and my Uncle would have been arrested for propaganda. I paid the price. It was ironic a grade 5 teacher told me that Smooks are all commies. Dad was Conservative. All the Smooks that I known are all Conservative. If I had the money I would have loved to sue those two teachers. As I said I never heard of this Battle. If it were not for that program I would have never had known. I started to do more researching to find out more about the history of this battle. The narrator of Go Deep mentioned the names of the pilots who died that battle. I missed 20 minutes of that program but the camera crew had the camera’s pointed towards the sign with the names of the deceits. That is how I known. will be retrieved. I am sure that A. Duckworth’s kin are hoping for the same. What really puzzles me is that I have sent emails to the Smooks. Not one ever replying. I presume its the same with you. Sad. Dad rarely spoke about his family. It appears there is a big secret of the Smooks. I too assume Harry is a kin to my Dad. Harry maybe a 4th 5th cousin to my Dad. I too would like to know. Harry and A. Duckworth served and died for our country. The other is W.j. Jackson – who is also still missing – having died for our Country. In conclusion I still ask myself why is this a huge secret. If you are still checking this site please contact me. Maybe we may be kin. I was watching a documentary on the History Channel. It was go deep. I heard the name of Harry Smook. It caught my attention. I am a Smook and wondering if Harry Smook is a kin to my Dad. My Dads family settled in Swan River Manitoba in the early 1900’s. When we were growing up I recall asking Dad about our background. Dad would ignore our questions. Why? We will never know. The day when Dad passed away he never spoke to us about his family etc. Maybe Dad’s Father had kin who chad also immigrated to Canada later. This part of the Military History really interesting. I would love receive info as well about Harry Smook. We may be kin or not. It would be nice to know.